My friend and blog supporter Anne sends me emails every month with lists of ideas of things that I should do that I've never done before. Back in March, the list she sent me included an activity for us to do together. 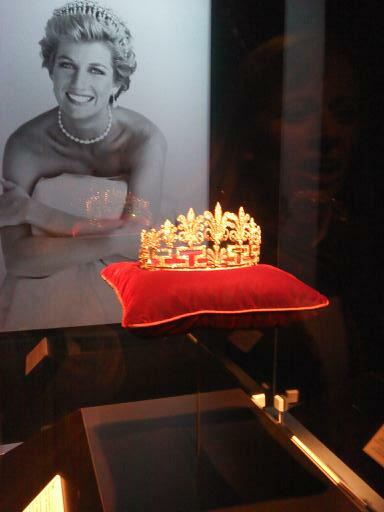 On Day 167, the thing I’ve never done before was to go to the Princess Diana exhibit at the Atlanta Civic Center with Anne. I had never been to the Civic Center and to be honest, when I first arrived, I wasn't terribly impressed. The place looked vacant and run down; hardly suited for any princess. Though I went on to be highly impressed by the exhibit inside, I'm still trying to figure out why they chose the Civic Center as the place to put it. Anne told me before we went that she has always loved Princess Diana. When she was a child, she had Princess Diana paper dolls instead of just regular ones. She was a big time Diana fan. I revealed to Anne that sadly, the only thing that I really remember about Diana was her death. And what's worse is that the only reason that I remember that is because she died the first weekend of my senior year of high school, which was the same weekend my friend Billy had a party at his house because his parents were out of town. I couldn't go to the party because I had a dance competition the next day and therefore missed out on drinking Busch Light and making questionable decisions with all of my friends. Why I'm able to remember these details about my life, but not useful things like how to speak Spanish is both confusing and unfortunate. Anne and I were among the last people to arrive at the exhibit that day, causing concern to the ladies at the ticket counter and the security guards, who were banking on leaving promptly at 6pm. They were sweet, though, even when I told them that we had come to the exhibit for some inspiration from the royal wedding for Anne's upcoming nuptials in June. A security officer pointed us to a dark hallway that snaked around to a larger space where we started the tour. I gasped when I got there. In the dark room was one of Diana's crowns that looked as though it was floating on a pillow in the middle of the glass case surrounding it. A large spotlight shone on the crown and behind it hanging on the wall, there was a gorgeous portrait of Diana, wearing a crown. It was gorgeous. Upon close inspection, Anne and I discovered that the crown in the case was not the same crown she was wearing in the picture. Another confusing and unfortunate discovery, but I was still in awe. I don't consider myself particularly "girly" or overly impressed by sparkly things, but I was in awe quite a bit during the tour. Several times I'd hear myself gasp or take a sharp inhale. The next stop on the tour was a selection of Spencer family heirlooms. Earrings, necklaces, pendants, hair pins all made up the collection and they were all gorgeous. It was at this point during the exhibit that Anne suggested we talk in British accents. I loved this suggestion and commended Anne on another great idea. However, my British accent sounds like the Australian guy on the Outback commercial, so while I encouraged Anne to go for it, I decided it was probably best that I not participate in the exercise. With so much to look at, there were obviously several interesting things to take pictures of. Unfortunately, however, throughout the exhibit, there was also a strict "No Photography" rule. Anne, who despite her straight and narrow upbringing, is quite the renegade who doesn't always play by the rules. So I would stand guard and make sure no one was coming while she snapped a few pictures. Next we went to a room full of Diana's childhood belongings. Porcelain figures (some of which were cracked), letters she wrote to her father from school, diaries, stuffed animals, all of which looked like they could've come out of my own bedroom, circa 1988. I wondered if, as a child, Diana ever could've imagined her impact on the world would've been so great that someone like me would pay money to view her things. Vainly, I kept wondering if ever there would be a day when my own things might be as interesting to someone else. And then I thought, "I sure as hell hope not." All of my diaries make me sound like I am a depressed, crazy person. I made a mental note that if I ever became a princess or found out that I was dying, to burn all the incriminating evidence immediately. Home movies and portraits of Diana with her family and friends lined the dark halls between rooms. Among the photographs was also a timeline and a brief history of Diana's life. From there I discovered Diana was also born into British aristocracy, but as a commoner, she was raised by her father after her parents divorced, and she was a ballet dancer. I also read that Prince Charles met Diana for the first time when he was dating her sister Sarah. Reading about Charles and Diana's courtship felt a little sad, not only because we all know that the relationship ended in divorce, but also because it seemed so clear to me, looking at keepsakes, that they never seemed very much in love at all. Charles, for example, sent Diana an official royal family Christmas card just weeks before he proposed to her that he signed, "Happy Holidays Diana. Best, Charles." Really, Charles? Is that all you could come up with? You want to marry this woman and that's all you have to say to her? It was like the writing was already on the wall, or in this case, in the cold, impersonal Christmas card. Maybe I'm still a hopeless romantic, but I'd like to think someone who wants to marry me might take the time to write me a personal message. Maybe this is how their relationship always was though, or maybe this is how people in royal circles operate. Marriage, love to them is less about connecting with someone and spending a lifetime with a best friend and more about a business arrangement. 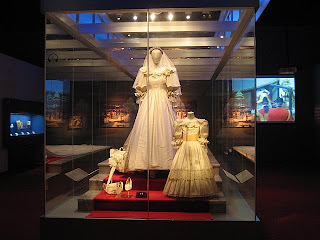 Despite the way it ended, seeing the Princess' wedding dress was amazing, and worth the price of admission. The 25 foot train, her shoes, the veil are all majestic, just as she was on that day. According to the exhibit, nearly one billion people watched the royal wedding in 1981. I was too young to remember it happening then, but I've seen it replayed so many times since, it's as if I was there. I chuckled to myself, thinking about brides-to-be who confess that on their wedding day, they "just want to feel like a princess." I wonder if Diana ever said that, considering on her wedding day she actually became a princess. 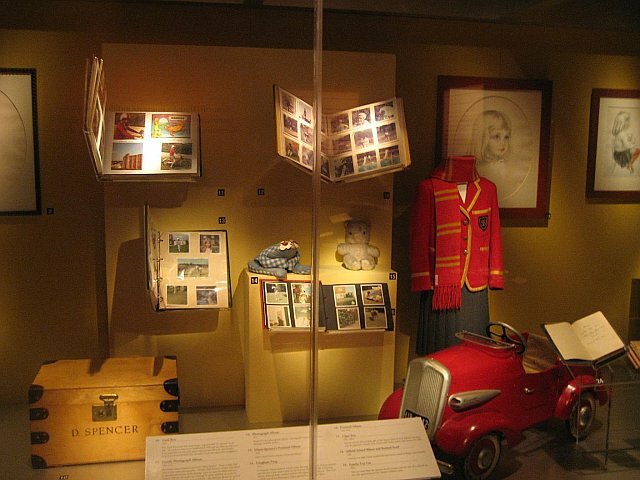 No part of the exhibit is more moving than a room full of items collected following Diana's untimely death in 1997. A large picture showing the countless homemade memorials to Diana is on one wall, and in front of it there are rose petals scattered on the floor. Diana's brother's notes for the eulogy he delivered at her funeral line the other three walls of the room. As a writer, I'm always interested in the process writers go through when choosing the right words and the right phrasing. Seeing the eloquence with which he wrote, even the first draft, at what had to have been one of the most difficult times in his life was more than just interesting. It was remarkable, and emotional. He so obviously loved his sister and exhibited an enormous amount of strength and class in his prose and in his delivery. Diana's death moved me like it moved a lot of people. Her senseless loss was devastating, leaving two boys without a mother, and the world with one less humanitarian. Thinking about that, reading Earl Spencer's words, with Elton John's "Goodbye England's Rose" pumping through the speakers above me, gave me the chills, and (don't judge), I actually teared up. The exhibit ends with a collection of Diana's clothes. Besides her work as a philanthropist, the Princess of Wales also became known in her life as quite the fashionista. Chanel suits, elegant evening gowns, even pants she wore into a land mine zone that were custom made by Ralph Lauren fill the glass cases, along with pictures from the events where she wore them. Though her good deeds were her most significant contribution, she was a classy, and beautiful lady. Princess Anne nailed it with this suggestion. The Diana exhibit is interesting, moving and a great way to spend a Sunday afternoon. It will be at the Atlanta Civic Center until June 13th. I would love to go see this! I've always been a huge Princess Diana fan ever since I watched her get married. We lived in Germany so we actually saw it as it was happening live on tv. GASP!! first lying to big D, now being an accomplice to illegal picture taking... it's a good thing alcatraz is no longer in the prisoner biz!! !